Introducing the newest additions to Giftsin24’s personalized picture frame collection: printed frames. These frames are made from the same, beautiful solid wood that all of our engraved picture frames are made from. But there’s a new twist: We create the personalization with shiny, colorful ink, not a laser. Available in 23 designs, these four-color frames bring your photographs to life. Vivid ink give these designs a bright and modern vibe. Plus, you’ll note the sharp, precise printing from our state-of-the-art presses. Our quality is always 100% perfect, and backed up by our Greatness Guarantee. From children’s themes to sports, from pets to patriotism, from school to love/weddings, you’ll find a design that’s right for your most cherished photographs. Besides adding color, these new printed picture frames offer a smooth surface that’s easy to clean. The ink is shiny and crisply printed and contrasts beautifully with the natural wood finish of the picture frames. 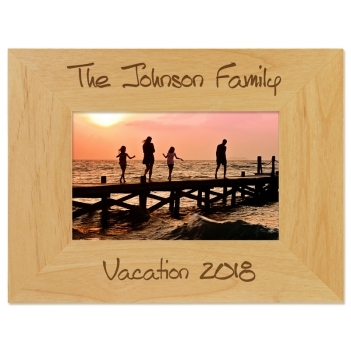 Personalized picture frames make wonderful gifts. Your friends and family will be deeply touched when they see a cherished photograph encased in a beautifully personalized picture frame. They’ll give your gift pride of place in their home, whether on a mantle, table top, shelf or piano. Each frame includes an easel back for standing, d-rings for hanging on a wall, and glass to protect your photograph. The opening accommodates a 4-inch by 6-inch photograph. Looking for gift ideas for the holidays, birthdays, children’s birthdays, new babies, weddings and more? Explore the entire collection of engraved and printed picture frames here. Finding a gift that wows them…isn’t that your goal this holiday season? We want our friend, sister, coworker or teacher to feel like we went above and beyond to find that perfect gift. 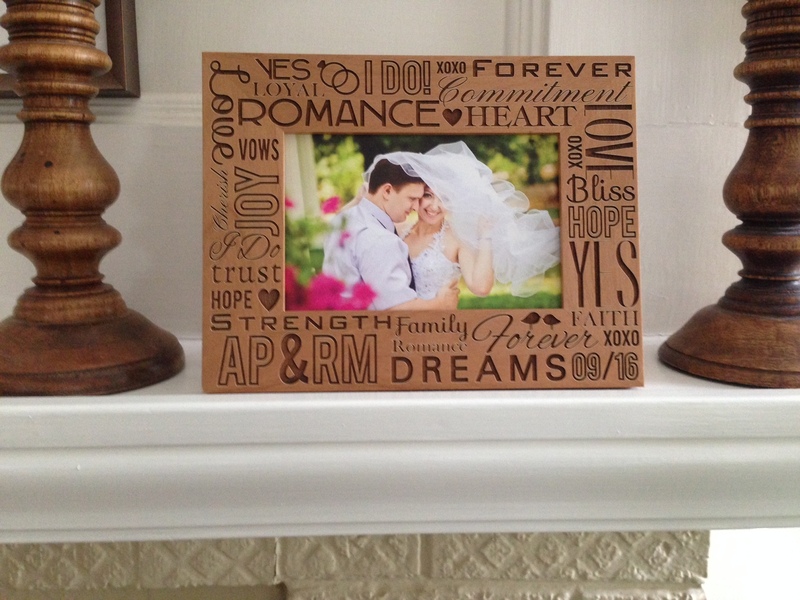 Giftsin24 has the answer: a personalized picture frame with a photograph that you have taken. 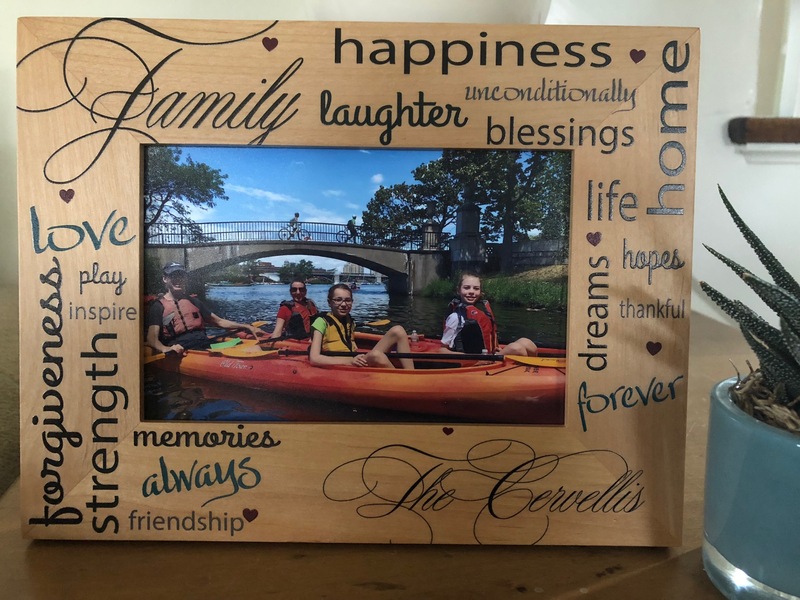 Our personalized picture frames are crafted of solid wood and laser engraved with a variety of designs and lettering styles so you can create memorable gifts they’ll cherish for a lifetime. Best of all, these quality frames are affordable and endlessly customizable for everyone on your list. Teacher appreciation: How about a personalized picture frame with a class picture? Maybe the photo shows that memorable special project she created with the kids? Or perhaps the photo is an adorable class group shot? Try the Treasured Moment Picture Frame personalized with Mr. Chu’s Class (or We Love You Mrs. P!) at the top and 2016-2017 at the bottom. Grandparents: This group can be difficult to buy for…they often have everything. Choose a photo frame that celebrates one of their most important relationships: with their pet. We have just the one: our One of the Family Picture Frame. It’s perfect for a dog’s name and your parents’ favorite photograph of their true-blue friend. Friends: Maybe your best friend sent the most beautiful holiday card this year. How about framing it in our Winter Picture Frame? The frame accommodates two lines of text, like a name, date, year or short phrase. Sibling: Did your sister or brother get married or have their first baby this year? 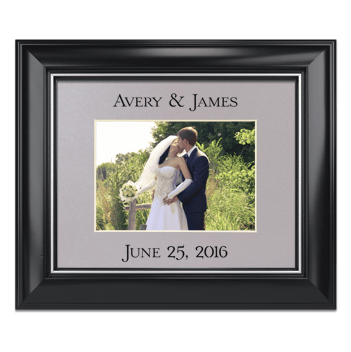 Choose the Loving Couple Picture Frame for newlyweds. Or try the Princess Picture Frame or the Choo Choo Picture Frame. These frames beautifully capture these life milestones. Your brother or sister will cherish these mementos for a lifetime. 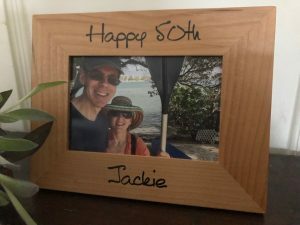 Our picture frame with personalized mat is a beautiful way to display your most cherished photos. Life is too short to let your best photos languish in a box. Our personalized picture frame mats are the answer. They are a wonderful way for you to display your most cherished photos. Personalized Mat with 8×10 Frame. Celebrate life’s precious moments with this personalized 5″ x7″ mat in an 8″ x 10″ picture frame. It’s a solid wood frame with glossy black finish and silver trim along the inner edge. Two lines of personalization on the mat can include date and year of weddings, births, birthdays, sports and more. Choose your lettering style, lettering color and mat color. Choice of vertical or horizontal format. Personalized Picture Frame Mat. Display wedding memories, party pictures and childhood photographs with this personalized picture frame mat. Choose your lettering style, lettering color and mat color. Choice of vertical or horizontal format. Personalized Picture Frames like this one, Treasured Moments, are the perfect way to show off cherished photographs and memories. You love our stationery, now try our new personalized picture frames! 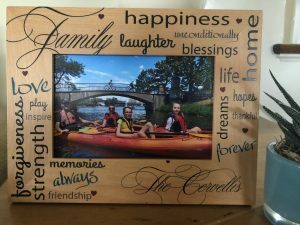 Introducing beautiful, natural wood, laser engraved picture frames. Choose from 9 styles to celebrate a wedding, a family, a loved one, a sports-playing child or a pet. Ordering our picture frames is just as easy as ordering our stationery. 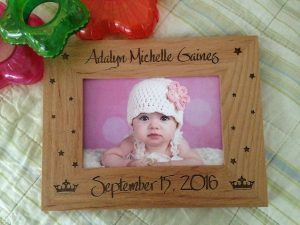 Send us names and dates, and we will laser engrave them into attractive, natural wood frames that hold your 4″x6″ photographs. We will nestle the frames into a sturdy white box for shipping within 24 hours. Makes the perfect gift. Check them out right now. 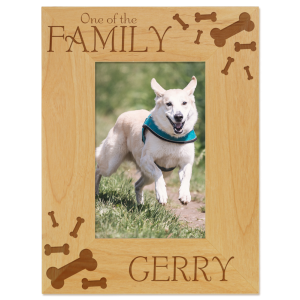 One of the Family Picture Frame: Show off your favorite furry friend with the One of the Family Picture Frame. You love and care for your dog, so celebrate that wonderful relationship with this memorable keepsake. Send us your dog’s name, and we will laser engrave the name into this attractive natural wood frame. Our Wedding Day Picture Frame: Give a bride and groom the special attention they deserve with the Our Wedding Day Picture Frame. 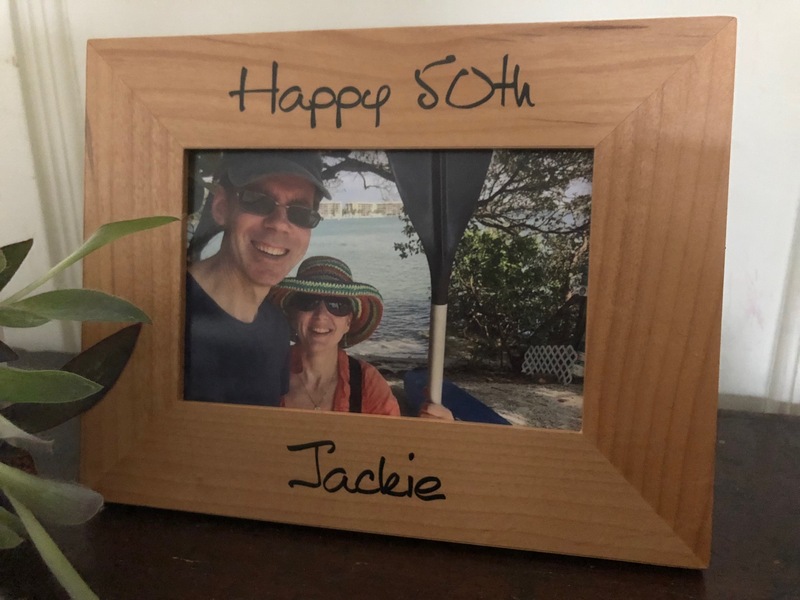 Send us their names and wedding date, and we will precisely laser engrave the words into this attractive natural wood frame. Forever in Our Hearts Picture Frame: Gone, but never forgotten. Cherish your memories of someone special by personalizing the Forever in Our Hearts Picture Frame. Send us a name, birth year and at rest year and we will laser engrave them into this fine wood frame.